Talent Strategy includes aligning the business strategy with the people plan. This plan includes creating the right talent strategy, the right organizational structure with the right processes and staffing to ensure you have the talent to execute on the business. Includes organizational capability and integration across the entire talent value chain to ensure execution on goals and objectives. Formalizing the right structure to operationalize the strategy through the way people work together across the organization. Defining and cascading goals for clarity and measurement of success for every employee. Defining the critical skills, experiences and behaviors critical to the business at all levels. Creating a robust talent pipeline and talent review process to ensure future succession within the organization.  Leveraging organizational capability for true execution requires the development of a talent strategy that links business strategy, organizational structure and talent processes.